Fabric Material: 20% recycled leather, 20% Fabric, 60% Polyurethane. 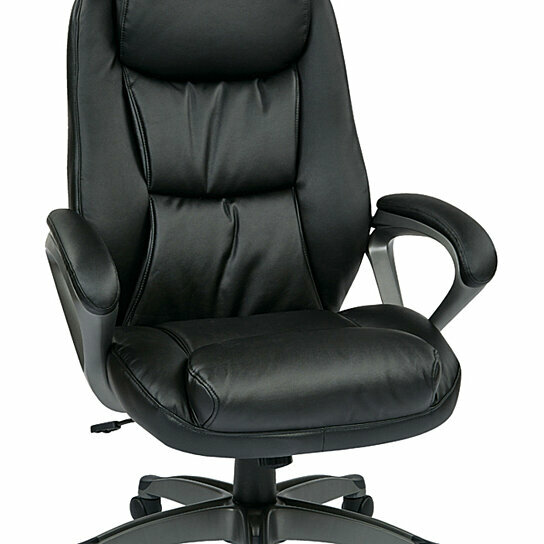 Executive Bonded Leather Chair with Padded Arms, Headrest and Coated Base Feturing Coil Spring Seating Comfort. Outer Materials: Metal, Nylon, Bonded Leather. Assembled Dimensions: 30"D x 28.25"W x 47.25"H, Seat Range: 18.5" - 21.25", Seat Travel: 2.75"
Arms to Floor Minimum: 26", Assembled Net Weight: 41 lbs. Color: Black.